Calvin is one month old as of yesterday. I know I know, tomorrow he will be in high school. It’s all going so fast and yadda yadda. How does it happen!? 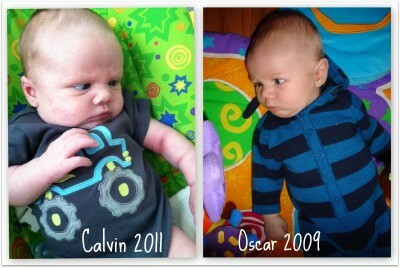 I’ve been reading through old posts of Oscar at one month old to see if I am forgetting anything that worked with him or repeating old mistakes and something hit me. Well, I mean I guess I think I was funny, but what really struck me was that I had such a bright, positive attitude. I could laugh in the face of distress! And sitting here thinking about the past 8 months of craziness, I feel like the distress has started to laugh at me. It’s a slow process I think. This getting bogged down in the mire. And it sneaks up on me like those extra 10lbs I seem to gain every year. And I think it’s a season. In fact, I feel like the seasons are about to change. Being a mother does things to a woman. We are forced to grow up, really put someone else’s needs ahead of our own and take the high road way more often than we feel like it. Motherhood affects marriage too. There are fewer date nights, fewer late nights and a lot more up-all-nights. Conversations take place while talking over The Wiggles music, during a too short dinner or in the morning with just enough sips of coffee to take that snark out of my voice (usually…maybe). Yet, this season of parenting young children is fleeting. Oscar is already a full on KID at two and a half. My newborn baby that I just walked in the door with, is now a month old. We are growing up. All of us. When you grow up, there is a loss of some of that wonder. The thing that makes us optimistic and gives us hope. It’s certainly NOT replaced with hopelessness, but simply a reality that is unique to me and my family. And when some of that mystery goes away, perhaps some of the humor goes with it. Or maybe, I just need to look elsewhere. Last night as we thanked Jesus for our food, we held hands and bowed our heads as we always do. Except, this time, Oscar immediately started “snoring”. It was all we could do not to burst into laughter right then and there! And so it seems my sense of humor didn’t go anywhere, I just passed it on down. I have a feeling that watching these boys grow up together is not only going to revive my sense of humor, it will enhance it like never before. And to that I say, Bring. It. On. This was a great post, Andrea. I loved it. I loved your paragraph on how life is once children arrive. So true. Thanks so much. It really is one of those things you don’t get until you live it. Thanks for sharing your joys and struggles. It’s so much fun to watch their little personalities (and humor) develop. Cam is our comedian. Sometimes, it’s hard for me to believe that these little guys can have such amazing comedic timing. Praying for your strength and joy! The joy of the Lord is your strength… let Him supply it. Love you, girl!! So enjoyable. Reading this, I do wish I began blogging earlier. My children, my family are not the focus of my writing, but they are the foundation. I’m sure I would have captured the essence of my now (gulp) young adult children just as I am beginning to with my toddler & third grader. In my opinion, everything is better, more vivid with humor. Passing it down to our kiddos is the gift that keeps on giving. Enjoy, even in times when you wipe tears, allow yourself a little laughter – at yourself. With yourself. And your little selves. Such wise advice! I am thankful I started blogging when I did. Much of the time when I thought about quitting and didn’t it was because I love having this record of our lives. Love this friend. You are a fantastically funny, witty, and caring person…but it can be hard to see that about one’s self. Know that we all see it and we see the amazing mother that you are. Great post! Thank you for the wonderful encouragement! And you are so right, we need our friends to remind us of the things we don’t see. It’s so easy to see it in others. I just love this post. Passing down the humor is so true… Big Roo makes up laugh so much. Humor is such a key to a happy family. Great post! And all so very true. If a family can’t laugh together . . . well, that’s just sad. My little one is almost 4 months old and I am wondering where the last 4 months went. I always lose my sense of humor for a bit after having a baby. But it does seem to return with some gusto. Kids are great fodder for humor. Children naturally have that optimism and humor that we moms sometimes lose. It is one of the best things when I see my older children’s sense of humor and realize they got it from me. Great post! You know, I just read something I wrote in 2009 today also. It’s fun to take a look back and say, hey, I wasn’t so bad. Good job, mom. Good for you! I think as mothers, we are so hard on ourselves ‘in the moment’ that it’s hard to see how hard we are working.